Seattle started 0-2, but won 10 of its final 14 games to get to the playoffs — a streak that began against the team it plays Saturday in the wild-card round, the Dallas Cowboys. Pete Carroll wasn’t really having it with the ready made story lines this week as Seattle prepared for Saturday’s wild-card playoff game in Dallas against the Cowboys. Keys to the Game | What does Seattle have to do to beat the Cowboys? Welcome to the weird, wonderful world of Seahawks Twitter. Care to partake? Truth is, in the way that story lines are often messier and more complicated than maybe we’d like them to be, there’s truth in both views. Dallas is no doubt a different, and apparently better, team having added Cooper in mid-October and with the defense increasingly finding its way, winning seven of its past eight games, highlighted by a sweep of last year’s Super Bowl champs, Philadelphia, and a 13-10 win over the Saints. But the Seahawks are different, too. In one sense, maybe that’s not so good. Earl Thomas had two interceptions for Seattle in the win over the Cowboys on a day when the Seahawks had a 3-0 turnover edge that was as much of a key to the win as anything. His three interceptions in just four games finished tied for the team lead. But Seattle also played that day without Doug Baldwin. Brandon Marshall tied for the team lead in targets in that game with six, though he made just two catches, a performance that helped usher his way out of Seattle a few weeks later. And most important, Seattle that day recommitted itself to the run, even if it was a little hard to tell how good of an idea it would turn out to be. As Carroll noted, the Seahawks didn’t necessarily do it well that day, gaining just 113 yards, Seattle’s fourth-lowest total of the season, and got just 2.9 yards per attempt, the second lowest. But more to the point was that they ran it 39 times, 32 by Chris Carson, which remains a career high. 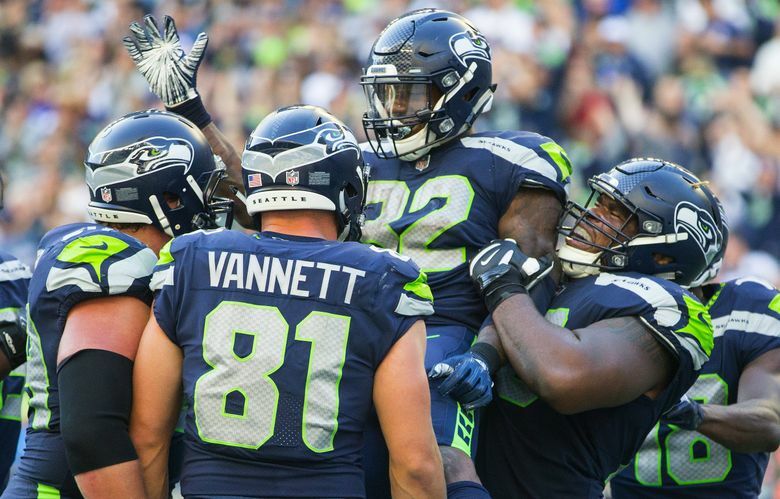 The 39 carries also remains the fourth-most rushing attempts in a game this season for Seattle and was more than the Seahawks had rushed in their first two games combined. Recall that those were each losses, defeats at Denver and Chicago that appeared to have the Seahawks on their way to fulfilling all those low expectations, games in which the Seahawks ran it just 38 times while throwing it 69. Carroll took the blame for what happened against the Bears, saying he had encouraged first-year offensive coordinator Brian Schottenheimer to take a few shots in the passing game, especially during a weird third quarter when Seattle had two quick three-and-outs. If there was a turning point in this season, it came the next day at the VMAC in Renton when Carroll and Schottenheiemer met. Schottenheimer had been Carroll’s handpicked choice to be the new OC to replace the fired Darrell Bevell in large part because of his running-game background. Schottenheimer has recalled getting a phone call out of the blue last January from Carroll asking him if he’d be interested in the job. Six days later, they ran it and ran it and ran it some more against Dallas (it helped that D.J. Fluker also made his Seahawks debut that day at guard). And if they didn’t really kill it statistically, they had given birth to a personality that would carry them to a win that day and start a streak of 10 wins in 14 games that leads them to Saturday in Dallas. Not that the Seahawks have forsaken the pass. Russell Wilson threw a career-high 35 touchdowns this season but did so on just 427 attempts, his fewest since the Super Bowl title year of 2013, finishing with a career-high touchdown percentage of 8.2. That Carolina game is instructive. Dallas may try a similar tactic of selling out to stop the run and see if Wilson and Seattle’s receivers — which will now include Baldwin — can beat them. But as the September day against Dallas showed, don’t expect the Seahawks to veer much from the strategy that got them this far. “We were just getting started,’’ Carroll said of the first Dallas game. The Cowboys would like nothing better than to now be the team against which they finish. But leave it to Carroll to want to mess up another story line.